BRIDGETOWN - On the heels of a 7.3 magnitude earthquake in eastern Venezuela that caused structural damage to buildings in that country as well as in other Caribbean islands, and a warning that there could be another strong tremor over the coming days, seismologists this morning recorded a 5.9 magnitude quake in the same general area. Around 5:31 p.m. yesterday, an earthquake centered near the Venezuelan town of Guiria, but felt as far north as Dominica, as far west as Colombia, and as far south as Guyana, shook the region. It was the largest to strike Venezuela since 1900, according to the United States Geological Survey (USGS). 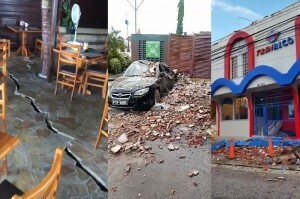 Residents of Venezuela, as well as other Caribbean countries including Trinidad and Tobago, Grenada, Barbados and St Vincent and the Grenadines, reported seeing buildings and vehicles swaying, telephone polls fall, walls collapse, and floors crack as the shaking continued for well over a minute. The Trinidad-based Seismic Research Centre (SRC) of the University of the West Indies initially put the magnitude at 6.7 and later revised to 6.9. But the USGS recorded the magnitude at 7.0 before upgrading to 7.3. Despite the intensity and duration of the tremor, no tsunami warning was issued. But seismologist at the SRC, Dr Joan Latchman served notice yesterday evening that there would be several aftershocks for days and even years to come. At the time she spoke, there had been at least seven of them recorded. Dr Latchman also indicated that another earthquake was likely to occur soon. “We expect that we can have an earthquake in the 5.0 to 5.9 magnitude range and this can happen within hours. Going by what we have seen in the past, within three to five hours we would not be surprised—or tomorrow, or sometime this week,” she said. Yesterday morning, around 9:27, a 5.9 magnitude quake was recorded. The first quake was located 57 km southeast of Carúpano, 92 km northeast of Maturín, and 133 km southeast of Porlamar, according to the SRC. The second was located 40 km east southeast of Carúpano, 100 km north northeast of Maturín, and 116 km southeast of Porlamar.